This is our recipe for Classic Chili or Wisconsin Style Chili. It’s a recipe I have been making for many years. I always made a big pot of this delicious chili every year on Halloween. Nothing hits the spot better than a hot, steamy bowl of chili when you come in from the cold. Serve with lots of buttered saltine crackers and a sprinkle of shredded sharp cheddar cheese. Doesn’t get much better than that! This chili is perfect. My sister Barb gave me this recipe many years ago. 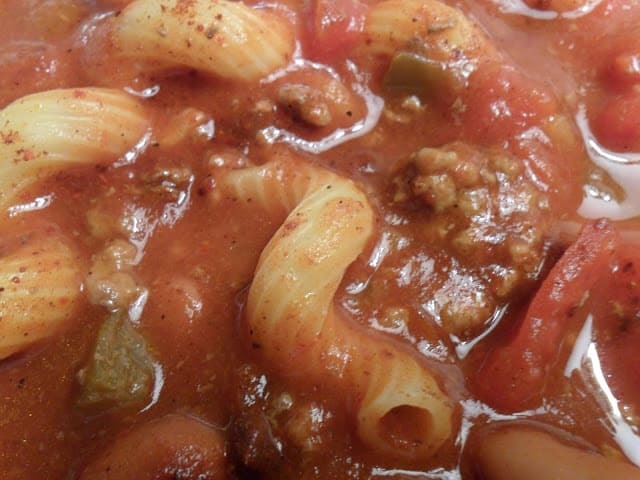 The recipe was very basic and since then I have tweaked this recipe several times. It’s still a very simple recipe but very delicious all the same. Bowls of chili are great to serve during or after football games, ice skating or after a day of snowmobiling. Bring a thermos along with you when you go hunting or ice fishing. 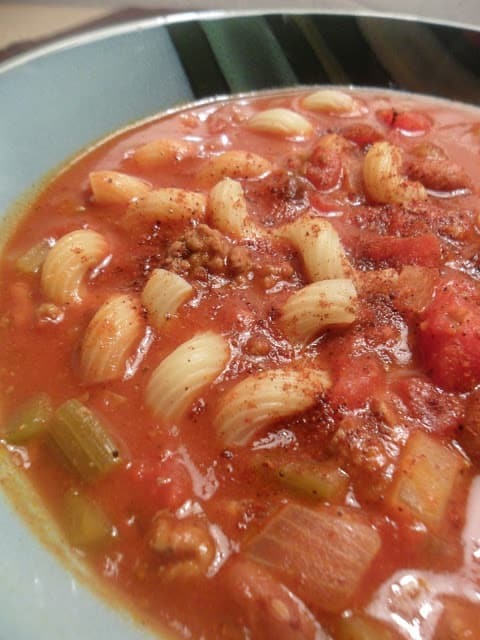 This chili recipe will warm you up and hit the spot every time. 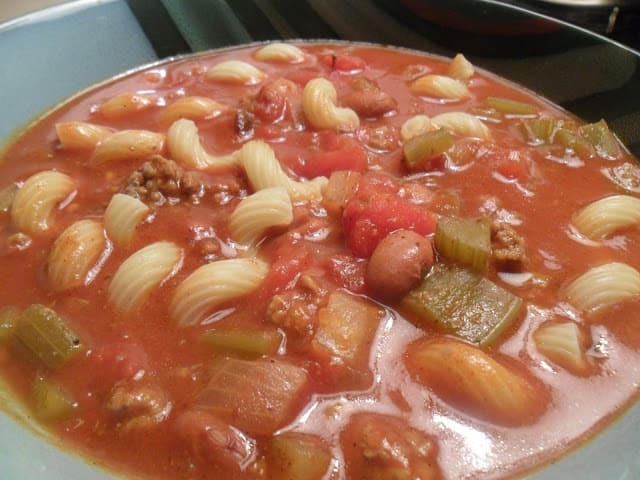 Classic Wisconsin Style is never served “over” the noodles, noodles are added to the chili. Grated cheddar cheese can be served on top of the chili, but this is a recent development (at least in my family). The only beans used are light or dark red kidney beans. Chili powder is usually the only seasoning added besides salt and pepper. Always add chopped onion and celery, maybe chopped green peppers. Ground beef is the meat of choice. A delicious and hearty chili that is perfect on a cold evening. In a large soup pot, brown ground beef, sausage, celery, onion, green pepper and garlic over medium heat until meat is no longer pink. Drain. Add tomato juice, diced tomatoes, diced tomatoes with green chilies, diced green chilies, tomato soup, water, beef broth, kidney beans, black beans, chili beans, chili powder, red pepper flakes, bay leaves, brown sugar, envelope chili seasoning mix, salt and pepper. Bring to a boil, reduce heat, cover and simmer for 1 hour or longer. Stir in noodles, cook, uncovered for 10 minutes or until heated through. Before serving, discard bay leaves and top bowls of chili with shredded cheese. My sister gave me this recipe many years ago. All ingredients with an * after it have been added to the original recipe over the years. Looking for more delicious recipes?? Try these…Warm Turkey Fiesta Dip, Green and Gold Corn Dip and Grape Jelly Meatballs. Campbells Soup, Sacramento Tomato Juice. G'day! Your photo reminds me of the chili we used to have when I was little, true! Thank you for allowing me to relive that memory through your recipe too! This sounds delicious. I love the idea of adding pasta. Thanks for sharing on Foodie Friends Friday!